As with a lot of things in the realm of smart home technology, the promise of amazing convenience can sometimes be muddied by bugs and idiosyncrasies. This has proven to be very true of even some of the best smart locks. An electronic door lock is one of those things that really needs to be working reliably. Especially if it’s a truly keyless door lock. If you can’t trust it to be locked when you need it to be or unlock when you’re trying to enter you’ll kick it to the curb in a hurry. We’ll dive into the ins and outs of the best smart locks on the market and help give you the info you need to decide which one will be the best option for your unique situation. The August Smart Lock Pro is not from a traditional old-school lock manufacturer but they brought a fresh perspective on the idea of automated home locks. This device is a retrofit device that is designed to replace the latch for locking and unlocking your door on the inside of the door. The exterior side of your existing door will look the same and the key will still operate the same. The August Smart Lock wifi lock that uses geo-fencing to automatically unlock your front door when you arrive home. It detects when your phone with the August app has entered within a user-definable distance from your home and then automatically unlocks your door. This is a fairly reliable solution but honestly it’s not as reliable as I would like. On occasion it doesn’t trigger by the time you get to your door. You can connect with Apple HomeKit, Amazon Alexa, or Google Assistant and use them to trigger the unlock. I found asking Siri to lock or unlock the door via my Apple Watch to be most convenient for me. I got too frustrated going to my door and finding it locked when it should not have been. It requires the purchase of either August’s Doorbell or the August Connect to get it connected to WiFi and take advantage of all its features. 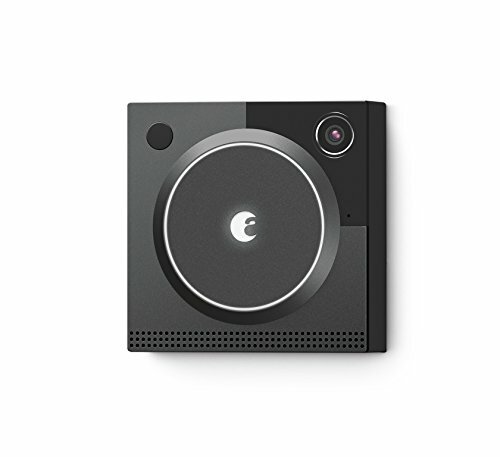 The August Connect is just a gateway so I’d recommend the August Doorbell since you’ll get more bang for your buck. The features are the most robust of the competition. 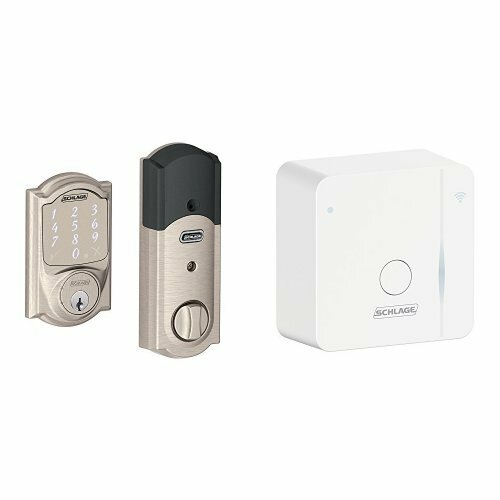 Also, the new August Smart Lock Pro includes DoorSense which is simply a pin switch that it uses to detect if the door is open or closed. This is a great addition. Something the competition also lacks. This makes it the best smart door lock in our eyes. A wireless keypad is also available and is a welcome addition. Personally I’d love it if it could tap into the August Doorbell hardwired power connection as opposed to having yet another device with batteries that occasionally need replacing. The Kwikset Kevo (2nd Gen) is a stellar solution from the old school company. The August Smart Lock comes in first but only just edged out the Kevo for it’s features. For the most consistently reliability in a smart lock you can’t beat the touch to unlock of the Kevo. That said, it’s not perfect so there will be rare occasions when tapping the lock won’t get the door unlocked. The Kevo works similar to most keyless cars. When you touch the lock it unlocks. It works via Bluetooth and your phone so you have to be fairly close to the lock (40′ or less) which makes sense since you’re touching it to unlock it. It isn’t quite as instantaneous as the door lock on my Volkswagen but after a second or two the door is unlocked. Of course you can still use a normal key and the available smartphone app. The bad news is that you’ll need the $100 Kevo Plus plug-in gateway for it to work beyond the very limited Bluetooth range. Without this upgrade the app is almost useless. The Kevo integrates with Google Nest and specific Honeywell Thermostats as well as the Skybell and Ring video doorbells but unfortunately doesn’t support Apple HomeKit or Amazon Alexa. Kevo uses 4 batteries and typical lifespan is 1 year and will warn you in plenty of time to swap the batteries out before they die. The Schlage Sense Smart Deadbolt is a great product with a few caveats. The Sense Smart works with Apple HomeKit assuming you have either an Apple TV or the option Schlage Sense Smart WiFi adapter within a minimum 40′ of the lock. The WiFi adapter is required for accessing your lock via a smartphone app beyond 40 feet. It doesn’t have as much versatility as some of the competition but it is a solid performer and an excellent choice if you plan to connect it with Apple HomeKit. If you want to set up any automations you’ll need HomeKit for that. It isn’t going to automatically unlock when you arrive home but with additional HomeKit-compatible products you may be able to sort out a solution. The best part about integration with Apple’s HomeKit though is the ability to ask Siri to lock or unlock your door. If you’re looking for a more simple solution with the convenience and reliability of a keypad and Siri control it’s an excellent choice. 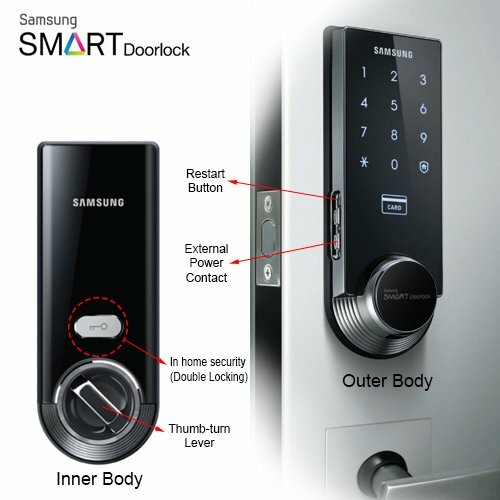 The Samsung Ezon SHS-3321 smart digital door lock from Samsung actually isn’t very smart. There’s no smartphone app. It doesn’t connect to anything via WiFi, Bluetooth, Z-Wave, ZigBee, or any other connectivity protocol. It does provide a keypad and some RFID tags for access. It doesn’t even come with a physical key. You can program codes obviously but otherwise it’s pretty limited in its functionality. What this lock does have going for it is some killer good looks and some reliable simplicity for locking and unlocking your door. 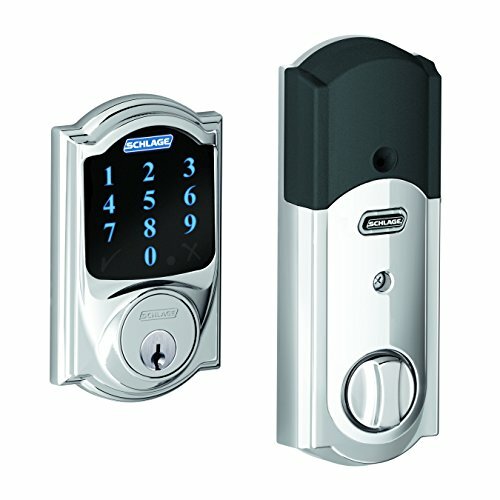 Samsung has a keyed version available and some spectacular looking mortise locks and handle sets. The SHS-p718 is particularly stunning and includes a fingerprint reader as well. I’d love to see some of these become at least connectable with Apple HomeKit, Google Assistant, or Amazon Alexa. The plus for this model not having a physical key lock is that lock-bumping and picking won’t work. Keypads are also very convenient and reliable. To prevent someone from looking for smudges on the keypad to determine the access code it presents with a key combination that must be tapped first prior to entering your access PIN number. If you aren’t looking for whiz-bang features and just want a secure alternative with some added convenience of a keypad or RFID it’s a beautiful option. The Yale Assure Lock is a very sharp looking touchscreen keypad replacement for your deadbolt. There is no keyhole or physical key which is great for a little extra security but not so great if you like the idea of a physical key as a safety net. The optional iM1 Network Module provides Apple HomeKit connectivity which is nice if you have an Apple device. If you’re an Android lover keep looking. 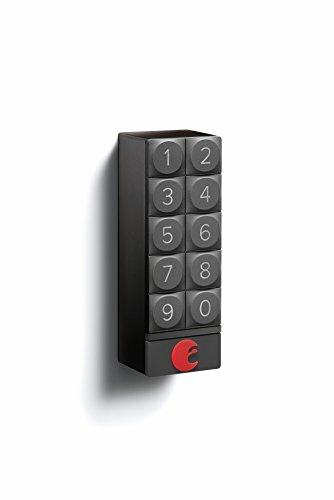 There are Z-Wave and ZigBee network modules available for connectivity to third party hubs if you’re really in love with this lock and aren’t an Apple device owner. 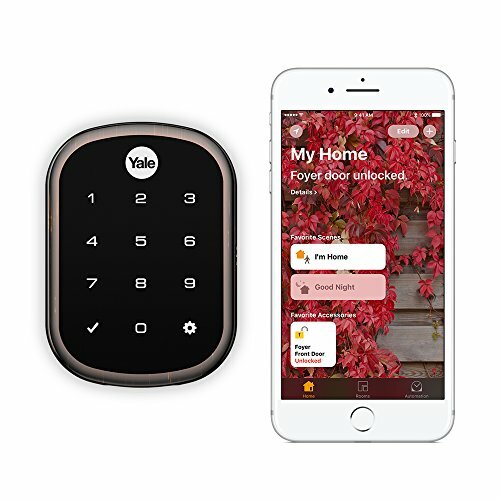 There’s a Yale app for setting codes and connecting to Apple HomeKit. You won’t get any auto-unlock features unless you pair it with Apple HomeKit and a 3rd party device to trigger the unlock. As far as smart locks go it’s certainly not on the deans list. One omission to note is the lack of PIN codes with an expiration. If you want to provide a guest with temporary access you need to set a reminder for yourself to delete the PIN out later. 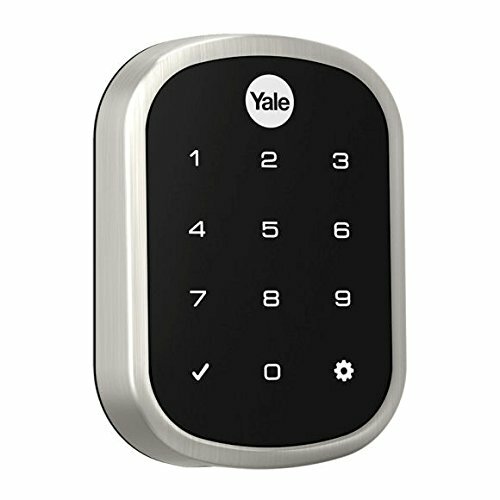 The bottom line on the Yale Assure Lock is that it’s a good solid device with some good features but not as advanced as the competition. 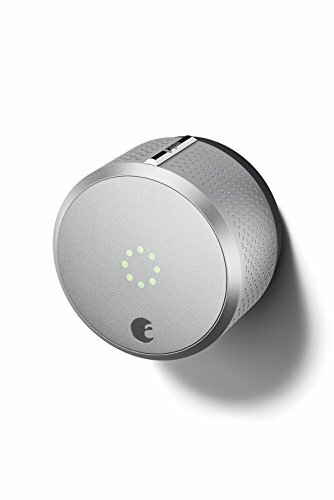 The August Smart Lock leads the pack among smart locks by a slim margin making it the best smart door lock currently available. It’s followed closely by the Kwikset Kevo. That said, for the ultimate in reliability though you’re going to want a keypad. Having a simple PIN code to enter via an integrated keypad is really rock solid for consistent performance and convenience. August offers a keypad but since it isn’t integrated directly into the lock like the competition it can occasionally have the connection lag or flake out. It’s rare and still a great addition so if you’re thinking about adding it to your August Lock purchase let me wholeheartedly support that decision. In addition to having a lock that’s dependable you likely wanted a smart lock for it’s robust features and automation. When it comes to that the August Lock is the hands down winner. Many of the others offer varying degrees of this but none match it. Your unique goals and desires will compel you in one direction or the other and honestly, any of these products should serve you well. 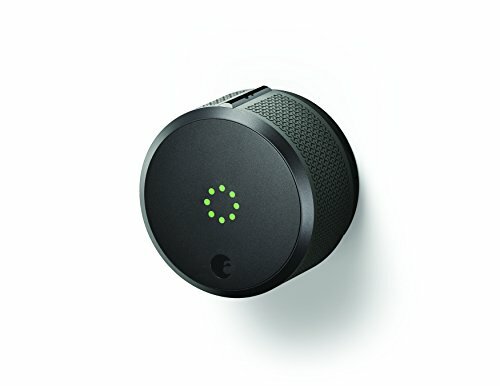 I personally love my August Smart Lock which I also have paired up with the Keypad and Doorbell. 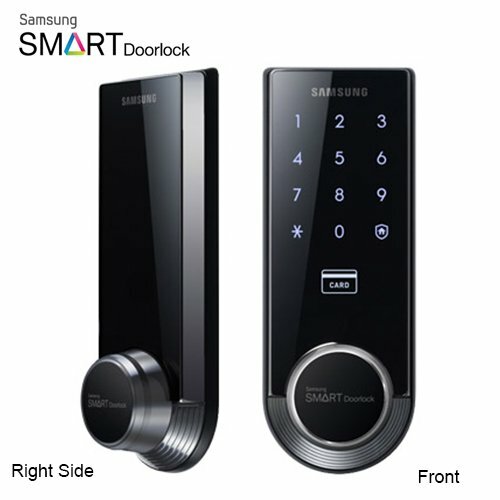 I’m surprised and disappointed by the Samsung line of smart locks. They’re so stunning but don’t feature any real integrations. It’s especially surprising given they’re such a huge competitor in the smartphone landscape. 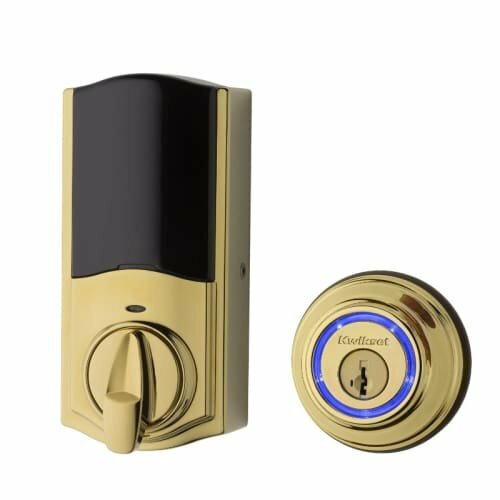 I hope this review has given you the information that you need to make an informed decision for choosing the best smart door lock for your needs. If you have additional questions be sure and sound off in the comments below. Good luck and happy automating!